All Photographs remain the Copyright © of Andrew Hayden. Enquiries regarding reproduction for publication in magazines, CD covers etc, please contact us. Bedfordshire has organs from Arlesey, Melchbourne, Pertenhall & Yelden. 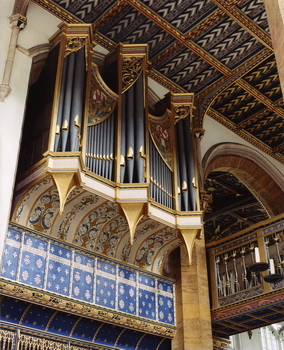 Buckinghamshire has the organ from Hardmead. Cambridgeshire has organs from Jesus Lane, Thorney & Yaxley. Cheshire has the organ from Eccleston. Cumbria has organs from Helsington, Kirkby Stephen & Rydal. Derbyshire has the organ from Tideswell. Devon has organs from Awliscombe, Black Torrington, Chagford, Ermington, Oakford & Withleigh. Durham has organs from Brancepeth, Burnmoor & Hartlepool. Essex has organs from Breat Bardfield, Radwinter, Stapleford Tawney, Upminster & Witham. Gloucestershire has organs from Kings Stanley & Winson. Herefordshire has the organ from St. James, Kinnersley nr. Almeley. Hertfordshire has organs from St Albans, St Albans Cathedral & Ashridge. Huntingdon has the organ from All Saints, St Ives, Huntingdonshire. Kent has organs from Elham, Hastingleigh, Maidstone, Tudeley & Wrotham. Leicestershire the organ from Houghton On The Hill. Lincolnshire has organs from Brant Broughton Chancel,Denton & Gainsborough. London has organs from Bermondsey, Cripplegate, Croydon, Dalston, Foster Lane, Lime House & Poplar. Middlesex the organ from Headstone. Norfolk has organs from Ashby, Barnham Broom, Besthorpe, Bridewell Alley, Briningham, Cawston, Colton, Denver, East Wretham, Edgefield, Gillingham, Gooderstone, Hethel, Hilborough, Hillington, Hingham, Itteringham, Kings Lynn, Mattishall Burgh, Mundford, Octagon, Oxborough, Postwick, Pulham St Mary, Redenhall, Sedgeford, South Raynham, St Marys, St Nicholas, Thornage, Tittleshall, Whissonsett & Wickhampton. Northamptonshire has organs from Castle Ashby, Crick, Finedon, Fotheringhay, Warmington & Wellingborough. Nottinghamshire has the organ from Egmanton. Oxfordshire has organs from Abingdon, Bampton & Hertford. Rutland has the organ from Upper Hambleton. Scotland has the organ from Colmonell, Darvel, Eyemouth, Kilbarchan & Kilwinning. Somerset has organs from Muchelney & Taunton. Staffordshire has organs from Hoarcross, Stretton & Tatenhill. Suffolk has organs from Badwell Ash, Bury St Edmunds, Chelmondiston, Edward Stone, Framlingham Unitarian Chapel, Great Ashfield, Lound, Shelland, St Michael Framlingham & Stowlangtoft. Surrey has the organ from Carlshalton. Sussex has the organ from Hove All Saints. Wales has organs from Radnor, Roath, Ruthin & Usk. Yorkshire has organs from Barton Le Street, Cawthorne, Giggleswick, Halifax, Harrogate & Shipley.